Greetings from Athens, Greece. Our ship arrived at the Athens Piraeus Habor this morning, having visited the islands of Patmos, Rhodes, Crete, and Santorini. On Paul’s 2nd Missionary Journey, when he left Beroea because of persecution, Luke writes: “Then the brothers immediately sent Paul off on his way to the sea, but Silas and Timothy remained there” (Acts 17:14, ESV). Paul apparently sailed from Beroea to Athens, and likely would have used the large Piraeus Harbor. In our travels, our group has seen the cities of the Seven Churches of Rev. 2-3: Ephesus, Smyrna, Pergamum, Thyatira, Sardis, Philadelphia and Laodicea. It was the island of Patmos from which John wrote the book of Revelation, having been exiled there because of his faith. He was exiled on the island of Patmos “because of the word of God and the testimony of Jesus” (1:9). 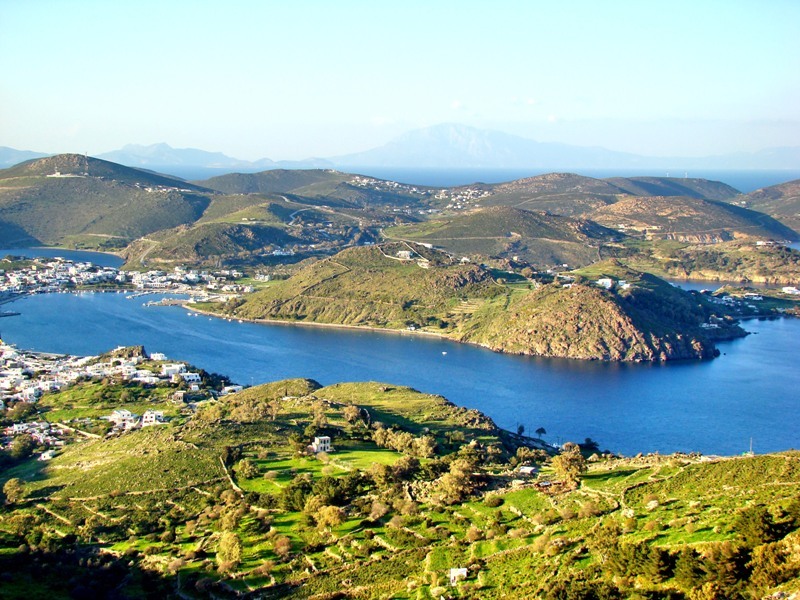 Pictured here below is Patmos. You can see the harbor of Scala in the center. Today we visited Mars Hill, the acropolis, and the Athens Museum. Tomorrow we are to go to Corinth. I did not have a workable system while on the Med. cruise, so I am a bit behind on the blog. I plan to post some more photos of the sites of the Seven Churches, and other sites in Turkey, as well as some on Athens and Corinth, so continue to check the blog. This entry was posted on Friday, March 19th, 2010 at 8:13 PM and is filed under Uncategorized. You can follow any responses to this entry through the RSS 2.0 feed. You can leave a response, or trackback from your own site.